Owing to the sound experience of variegated aspects of the market, we have been able to offer a range of Opthalmic Surgical Instruments. All our products are developed using quality approved titanium and stainless steel that are sourced from reliable vendors of the market. 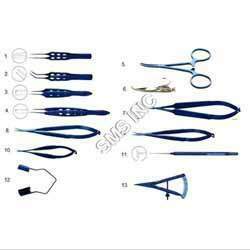 Patrons can avail a range of Phacoemulsification Systems, Slit Lamp, Keratometer and Ophthalmic Surgical Instruments, under this category. The products offered by us are made using imported craft alloys as per international norms.